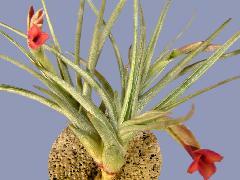 Sometimes argued to be a natural hybrid, possibly of T. albertiana X T. argentina. Ken Woods 08/04. D.Butcher ex-C.Larson ex-Isley. D.Butcher ex-C.Larson ex-Germany. Ken Woods "Unknown" 02/10. 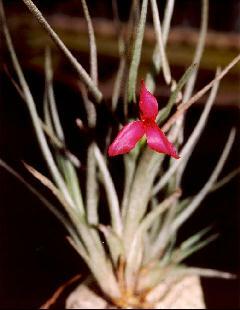 The 4th photo, from Ken Woods, was presented to the Tillandsia discussion group for identification. Ken had no details on source. From Maurice Kellett: "Your plant looks like a plant that I got from Chris 28/6/06. 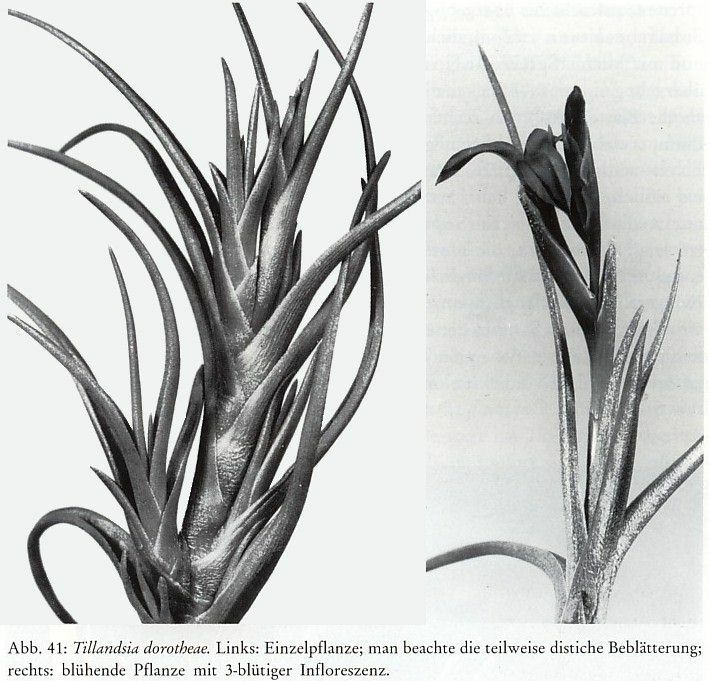 It came from Paul Isley as a large T. dorotheae and you can see the T. albertiana in it somewhere." Chris Larson: "This story has been here on Tillnuts a couple of times. Imported from Paul Isley - has Red to orange flowers. Bought as T. dorotheae. Derek diagnosed it as one of the "Mystics". It was sold at the WBC in Cairns. I asked Paul Isley if it was a hybrid - but he insisted 100% T. dorotheae. Doesn't look like it could be argued as a T. albertiana X T. argentina which some botanists are arguing is the case with T. dorotheae. Also it doesn't look like the photos I've seen of T. dorotheae - but Paul has been to T. dorotheae habitat. Some have got this plant from me - and many have it from the WBC. I have lots in flower now." John Olsen: "I bought Isley's plant labelled T. dorotheae at the WBC Cairns and others from Germany. They are different!" Derek Butcher: "Herein lies the crunch. 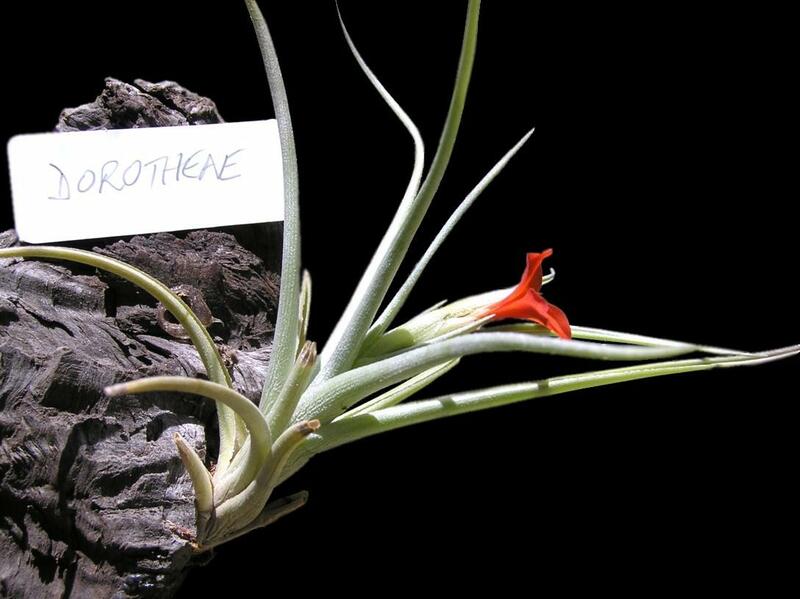 We know that Len and I got our T. dorotheae from Germany, collected from the wild and offsets taken. They did not appear to be the same clone but had a similarity and we are fairly certain of their authenticity. Because T. dorotheae appears (possibly) to be a natural hybrid you can expect back-crossing to either parent and thus variability. Now to plants from Isley. I do know that Paul and I had several emails before his book was published about how you identified T. dorotheae from the Dimmitt hybrids. Years ago I pushed Dimmitt to register the 'better' ones of his hybrids. I say better because his crosses were supposed to be primary hybrids where progeny should be fairly stable but they weren't!. I was sure that foreign pollen was involved somewhere, or that the T. dorotheae parents were already (natural) hybrids! So when Paul bought stock from Dimmitt under 'Mystic names' he was getting a dog's breakfast. We may never know where the wild T. dorotheae came from, whether it is a highly variable natural hybrid, which ones have been re-collected from a population undergoing back-crossing, or which are from the 'Mystics' collection. From a purist point of view I believe we in Adelaide have provenance, and others may also have Germany as a source. Is it a T. dorotheae that Ken has ?, or is it a 'Mystic' where only some were registered and the lesser ones were NOT culled. I can see very little difference in my two plants, but only one has a clear provenance. The ball is back in Ken's court to check on what photos we do have in this area." Steve Molnar ... "Simple yet elegant, a beautiful little flower on my T. dorotheae." 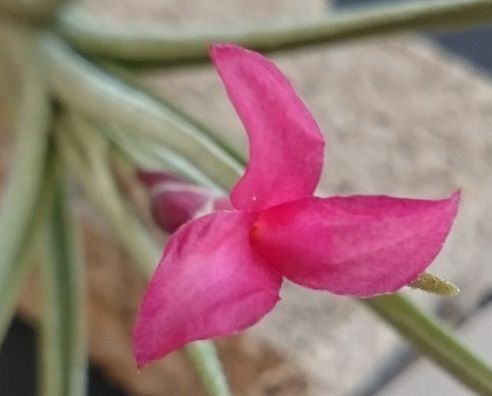 Pam Butler ... "Steve: I was told recently this maybe an albertiana hybrid. I currently have seedlings growing so it will be interesting to see if they all flower the same. Has anyone else grown seed from this plant?" 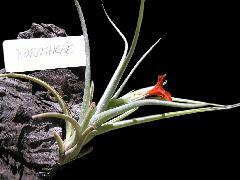 Derek Butcher ... "Yes, it is thought that T. dorotheae is a natural hybrid with T. albertiana involved. But don't forget that the Mystic hybrids are based on albertiana too. To me it is essential that records should be kept about where you obtained your plant. I enclose photos and original description. The one marked Query comes from the Tillandsia Too Hard Basket section and came originally from Isley. If anyone can tell me where they differ please advise!" * - See T. Mystic Circle for further discussion. Plant offsetting abundantly, laxly branched at the base, making a dense clump, single plant with 5 – 10 cm long stem, erect, branched at the base. Leaves arranged densely spiralled, sometimes showing a tendency to distichous, erect to spreading, branching at the base of the lower leaves. Sheath clearly seen, longish, to 1.5 cm long, 1 cm wide, at the base naked, white, membranous, occasionally pinkish violet, the top half white lepidote. Blade 8 – 10 cm long, similar to T. albertiana, thin lineal, 3mm wide, tipped, but not abruptly acuminate, topside deeply and thinly channelled, bottom side not keeled, nerved at the base, grey green, dense with silver white lepidote. 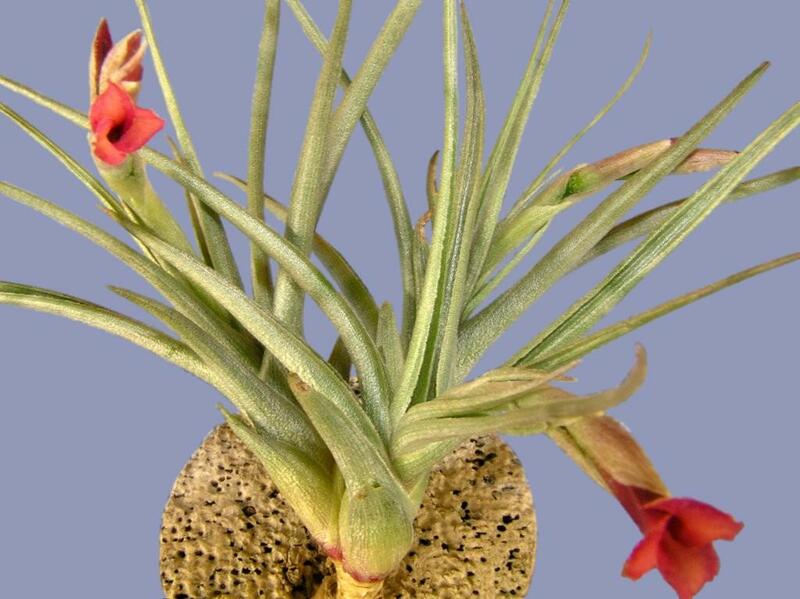 Scape shorter than the leaves, erect to bent over, 4 – 6 cm long, 2cm thick, round, green, naked. Scape bracts 3 – 4, densely imbricate, leaf like at base, the upper 1 or 2 with shorter blade. Inflorescence simple, to 3 cm long, 0.8 cm wide, bent over, with 2 – 4 lax distichous sub sessile flowers, shorter than the leaves. Rhachis thin, flexuous, flat on one side, 4 –5 cm long. Flower bract longish lance like, acuminate, 2 cm long, 5 mm wide , erect, at the bottom green to reddish, shiny, naked, carinate at tip and scattered white lepidote, a little shorter than the sepal. Sepals longish lance like, acuminate, 2.2cm long, 4mm wide, the posterior ones carinate, free, thin, green, red dotted. Petals longish lance like, 3.5cm long, with wide, recurved, longish lance like, acuminate, to 7mm wide, bright carmine red platte which narrows to a 3mm wide whitish point. Stamens deeply enlosed, with white, 9mm long, filament not thickened at the base and not transverse plicate. Anther 6mm long. Style 1.5cm long, well exceeding the stamens. 1. . Plant is larger, flowering to 20cm high, stem 5 - 10cm long, amply branched at base. 2. . Leaves polystichous, in young growth distichously arranged. 3. . 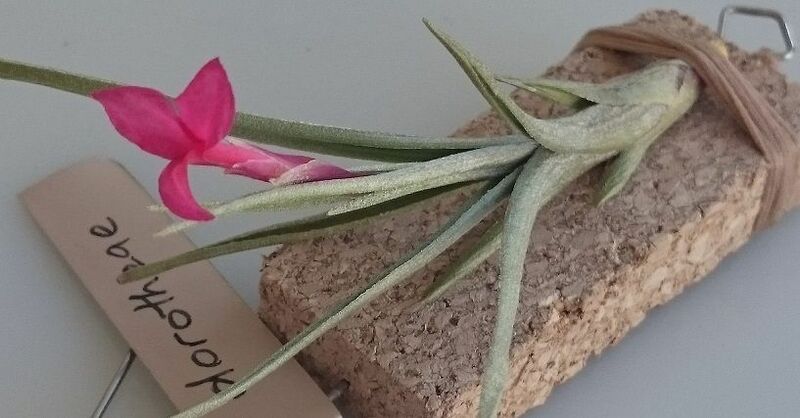 Leaf blade grey green not olive brown, to 9cm long, not abruptly acuminate, not keeled, partly round, whereas T argentina is to 5cm long, and underneath sharply keeled. 4. . Leaf Sheath clearly seen, white to reddish. 5. . Inflorescence laxly 2 – 4 flowered, bent over, not sword-shaped and complanate. 6. . Flower bracts carinate at tip, and as long as or a little shorter than the sepals; whereas T. argentina is ecarinate and much exceeding the sepals. 7. . Base of filament not thickened and not transverse plicate. 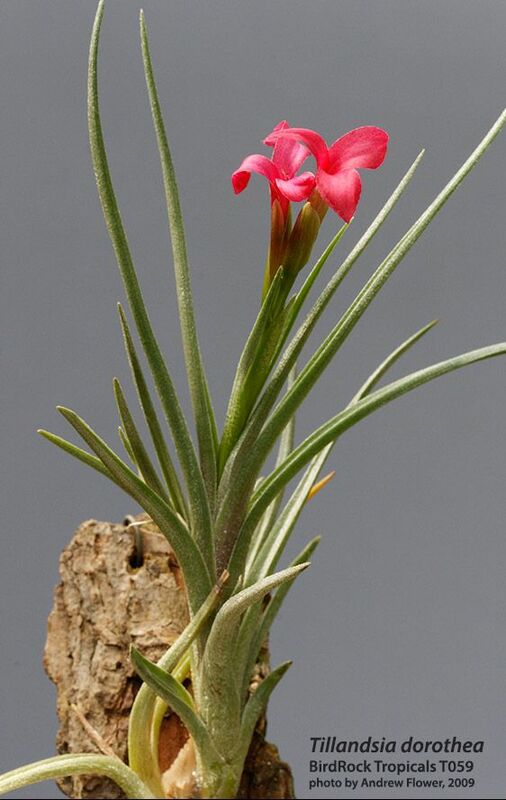 Up to now T. albertiana is only known from the type locality, (Rio Sauce near Tucuman) and the nearest locations of T. argentina are far from it, and it is hard to assume that T. dorotheae is a hybrid between the two. 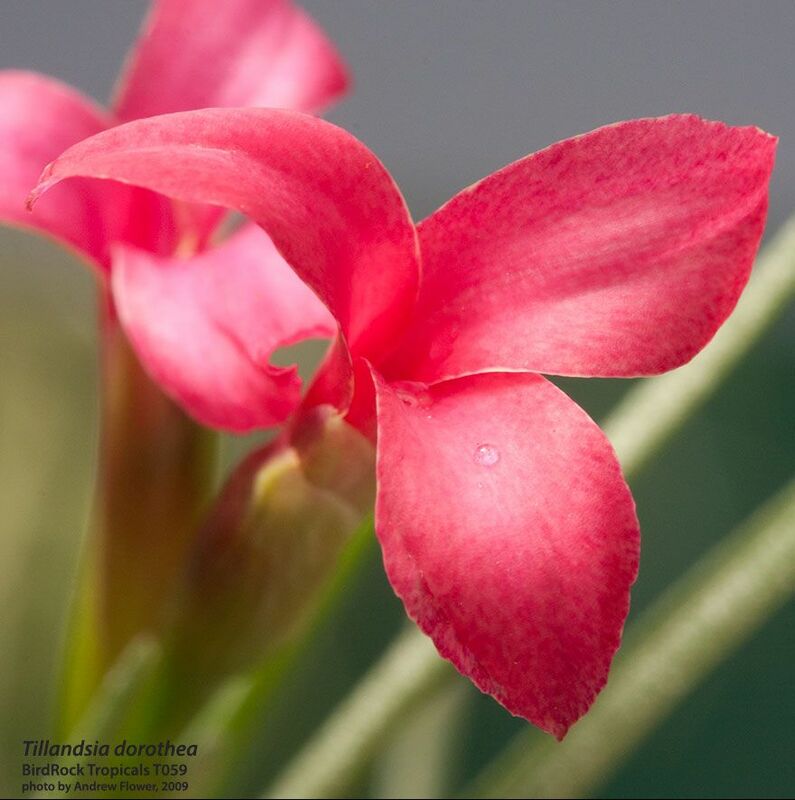 T. dorotheae has been cultivated since 1972 in the Botanical Garden in Heidelberg and has proved to be constant. 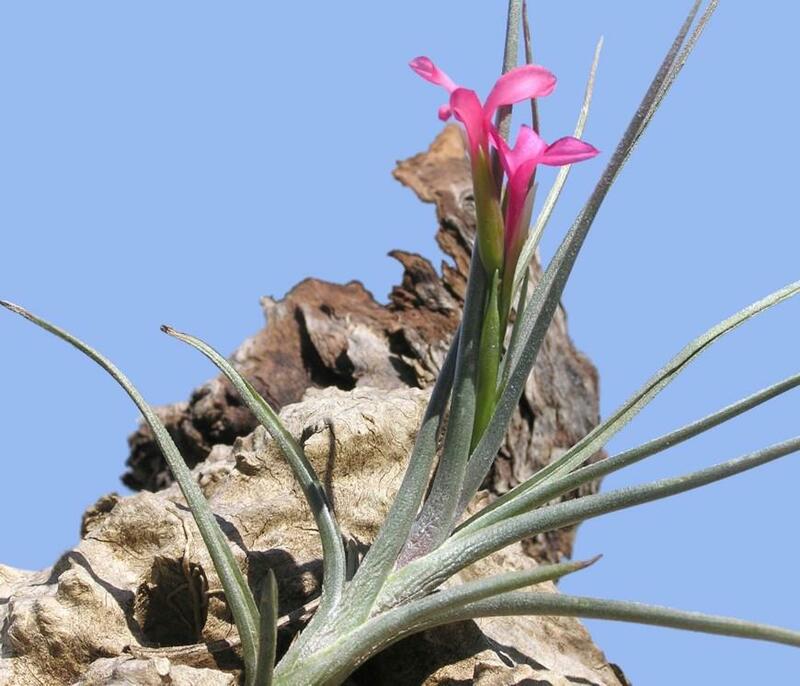 The flowering time falls, in cultivation, in the winter months; T. albertiana also flowers at this time, but T. argentina flowers in the summer months. 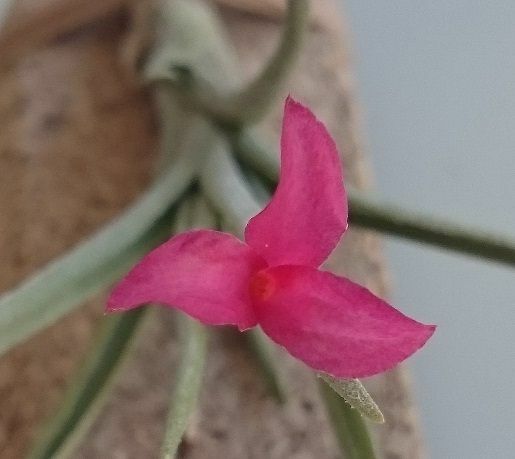 The flowers of T. dorotheae are open for several days and the petals dry the same colour.